Whimsical child's map showing the Republic of Texas. 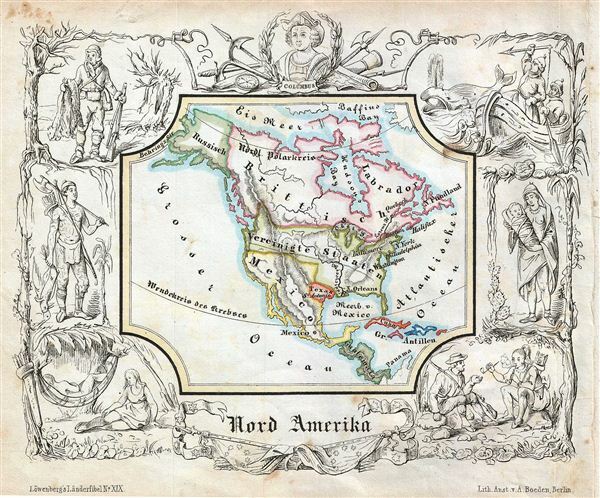 A delightfully whimsical 1846 map of the North America, from a German kinderatlas or children's atlas. The map details all of North America in the last year of Texas autonomy (1836 – 1846), thus the continent is divided with color coding into the United States (Vereinigte Staaten), Texas, Mexico, British America (Canada), Russian America (Russisch), Guatemala (inclusive of Panama), and the Antilles or West Indies. The whole is surrounded by wide border featuring various charming vignettes meant to illustrated peoples and culture of the region. These include rough and ready fur trappers, stylized American Indian, frontiersman smoking peace with indigenous Americans, an intentionally alluring American Indian woman, and intrepid New England fisherman spearing an angry whale. The whole is surmounted by a bust of Christopher Columbus. The map is accompanied by its adjacent page, which includes a poetic history of North America in German gothic type. The wonderful and rare map was drawn by Anst. V A. Boeden of Berlin for inclusion as plate no. XIX in the 1846 issue of Julius Loewenberg's Geographische Landerfibel.